The Family Medical Leave Act of 1993 is a sick leave law poster by the Federal Department Of Labor. This poster is mandatory for some employers, including all employers covered under the family and medical leave act. 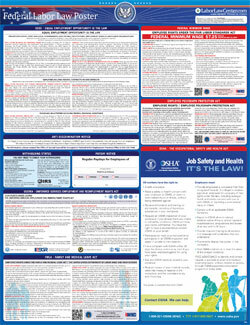 This poster describes reasons an employee can take medical leave, responsibilities an employee has when a need for medical leave arises, responsibilities an employer has for employees requesting medical leave, benefits, protections and entitlements of medical leave, as well as definitions for serious health conditions covered under the Family and Medical Leave Act. It appears you don't have a PDF plugin for this browser. Please see the link below to download federal-fmlaen.pdf. of FMLA leave in a single 12-month period to care for the servicemember with a serious injury or illness. may take leave intermittently or on a reduced schedule. substitutes accrued paid leave for FMLA leave, the employee must comply with the employer’s normal paid leave policies. While employees are on FMLA leave, employers must continue health insurance coverage as if the employees were not on leave. equivalent pay, benefits, and other employment terms and conditions. opposing any practice made unlawful by the FMLA, or being involved in any proceeding under or related to the FMLA. •	 Work at a location where the employer has at least 50 employees within 75 miles of the employee’s worksite. *Special “hours of service” requirements apply to airline flight crew employees. an employee must notify the employer as soon as possible and, generally, follow the employer’s usual procedures. FMLA leave was previously taken or certified. certification is incomplete, it must provide a written notice indicating what additional information is required. responsibilities under the FMLA. If the employee is not eligible, the employer must provide a reason for ineligibility.